From the drama club and orchestra to the lacrosse team and even Homecoming Court, kids from every corner of Avon High School came together in spirit and song recently for a fundraising cause. 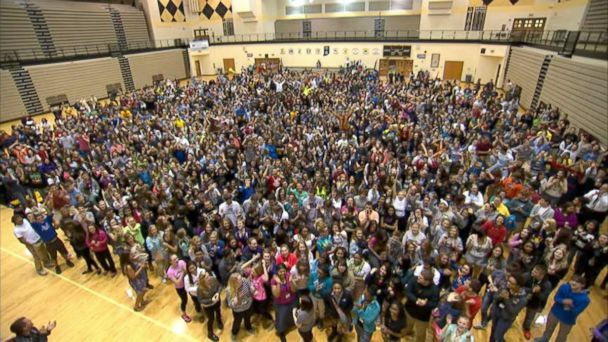 The cast of thousands - all students from the Avon, Ind., a school located in suburb on Indianapolis - turned up to sing seamlessly through not just the Teen Top 40, but 68 songs, all in 6.5 minutes. The video took one take and was posted to YouTube. "This video, this lip-dub was to raise awareness, to get people excited about going to the Riley Dance Marathon and support that cause," assistant principal Kellie Rodkey said. Rodkey said last year's Avon Dance Marathon had raised nearly $17,000 for Riley Hospital for Children so this year the students set a goal of $20,000. A student cameraman rolled along in a chair Thursday as it was pushed by a teacher holding an iPod. After six weeks of planning, enlisting participants and mapping out the school, it all came together flawlessly. "This is probably the most fun thing I've done in my teaching career," math teacher and video director Adam Clarke said. "Everybody was on board. … The message in the video is. … We are Avon."